This latest in the series by Tom Garvin on twentieth-century Ireland focuses on the 1950s, that pivotal decade during which Ireland belatedly caught up with the modern world. But it is history with a difference. Garvin reconstructs the period not on the basis of personalities or events but on what he calls ‘the public record of expressed public opinion of the time’. In short, he retells the story of the 1950s through the pages of the three Dublin daily newspapers: the Irish Independent, the Irish Press and the Irish Times. It is a unique approach, typical of Garvin’s originality as a historian, and despite the obvious methodological dangers the book is a triumphant success. The 1950s come alive with an immediacy and crackle seldom found in more conventional histories. The result is both exhilarating and disturbing. 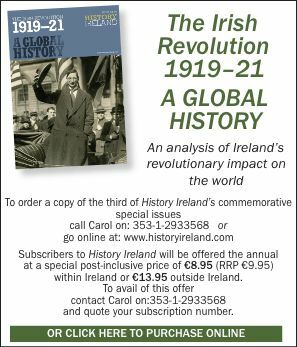 For those who look to history for more than narrative Garvin has by now established himself as the foremost analyst of twentieth-century Ireland. He is a historian with a mission: he doesn’t just want to recount what happened but to explain why things happened—and, as he had earlier done in his Preventing the future, to explain why things didn’t happen. No other historian has given us such insights, apart from Joe Lee in his monumental Ireland: 1912–1985, into the overlapping forces that determined the pace and direction of change in Irish society, and none writes with his passion or with such understanding as to why societies either change or stagnate. This study is a natural elaboration of his primary work on why modernisation took so long to take hold in Ireland. He has chosen the 1948–62 period because he believes that it was a crucial one of transition in the Republic, a sort of coming of age. The decade opened with Ireland as an avowedly agricultural economy and it closed with the transformation to industry and services well under way. Garvin tracks the debate as to how the economy should be developed, a battle between modernisers focused on industry and exports and traditionalists still wedded to farming. This, perhaps, is his most significant contribution to an understanding of how Ireland was modernised, although his dissection of developments in education are no less valuable. The witnesses he produces are not so much the three main newspapers as, more accurately, their journalists and commentators. Now the first problem with this approach is that what is written in newspapers doesn’t necessarily reflect the opinions of the mainstream of the population, writers being, as he says, ‘statistically atypical or mildly peculiar people and somewhat to the left’. On the other hand, each of the three papers was editorially conservative, albeit with a different take on conservatism, and this acted as a corrective. He labels them accurately so that the modern reader can understand where they are coming from editorially. The Irish Independent, with the largest circulation, he describes as a staunch defender of the emergent professional middle class, the Fine Gael paper and usually anti-statist and anti-socialist (it still hadn’t exorcised the ghost of William Martin Murphy). The Irish Press, the official organ of the Fianna Fáil party, was, according to Garvin at least, relatively forward-looking and developmentally minded, hence the most wholeheartedly modernist newspaper of the three Dublin dailies (which will come as a surprise to many of my vintage). The Irish Times he accurately describes as ex-unionist, with a deep-rooted commitment to agrarianism but with a counterbalancing sympathy for organised workers (it had not yet found its role as the voice of an educated liberal Ireland). These three papers are supplemented at times by referrals to minor journals, weeklies and pamphlets. That he has read widely of their respective columns is not in dispute, but the other problem with his methodology is that of selection. To what extent do his extracts fairly represent the tenor and thrust of the whole? Is he guilty of special pleading? The answer, to my mind at least, is that Garvin faithfully represents the Ireland of the fifties as it was and arrives at conclusions that correspond with the evidence he adduces. The Ireland unveiled here is not for the faint-hearted. It was marooned in insular seclusion, pauperised and socially polarised, rural, pastoral, pre-industrial, in thrall to monopolies and closed shops, devoid of entrepreneurship and riddled with superstition. The most damning features, of which the newspaper columns remind us, were the pervasive poverty, the widespread complicity in the domestic violence and sexual abuse that contradicted the moral values on which society was supposedly founded, and the appallingly low level of education that produced a largely compliant (and complacent) populace. Up to 80% of young people left school at the age of 12–14 with very primitive levels of education and unfitted for any work beyond low-level manual labour. It was no wonder, then, that during the decade some 400,000 emigrated and that the future of the country was in doubt. Garvin analyses these realities under the three broad headings of politics, the economy and, not unexpectedly, education. His treatment of the issues is sure-footed and he deftly exposes the forces that were frustrating change, primarily a bovine Catholic Church in cahoots with Fianna Fáil, while identifying, on the other hand, the forces that were working for change. If there are heroes to be found they are the politicians, especially among the Fine Gael and Labour-led interparty governments that ruled for six of the fourteen years he scrutinises. Brendan Halligan is chairman of the Institute of International and European Affairs and a former member of the Oireachtas.